The Gymini Musical Kick & Discover play center offers Baby an engaging and feature-rich developmental environment. The portable kick pad with a mirror and touch-sensitive light and musical effects is a detachable, stand-alone component that's as conveniently useful out in the yard, in Baby's crib, or in the car as it is on the Gymini. Fun accessories dangle on the flexible overhead arches, encouraging Baby to uncover a wealth of sounds, colors and textures. The Gymini includes the musical kick pad, tummy time pillow, elephant wind chime, giraffe rattle, jitter hippo, and teether. The arches collapse so you can fold the gym up easily. Weight: 3.5 lbs. Material: 100% polyester. Dimensions: 33"L x 28"W x 18"H. Machine wash cold and line dry. 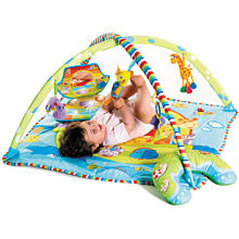 This is a great spot for working on tummy time with your baby niece or nephew! It also supports babies as they start reaching for the hanging items. 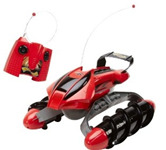 An attachable mirror and kick-started music encourage learning and exploration.